We were in the same high school and he was topper in the final exams. We became friends in the college where we did our pre-degree. We were together while working out the math and physics problems sitting silently on the back bench, and bunking the boring language classes. 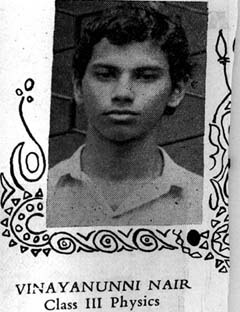 Unfortunately, he couldn't get through the entrance exam for engineering college admission and joined Union Christian College in Aluva to do his BSc, and I moved to Thrissur to do my engineering. Once we had been to Kochi with another pre-degree classmate Raman to celebrate our successes at entrance exams. We drank whiskey and later watched a movie in Shenoy's. That movie had the maiden appearance of Sheela Mani, a girl from my neibhourhood, as an extra. One day I had been to his college during the first year. I sat with him in an English lecture class; nobody recognized me as it was the beginning of the course and most faces were new. Next time Vinayan and Raman visited me in Thrissur at my hostel and that was the last time I met him.